Solar Means Business: Top Commercial Solar Customers in the U.S. Solar energy is being deployed on a massive scale by the most iconic brands and best-managed companies in the U.S. in order to help lower operating costs and increase profits. The Solar Energy Industries Association (SEIA) and the Vote Solar Initiative (Vote Solar) have unveiled a report naming the companies using solar on their facilities in the U.S., ranked by cumulative solar energy capacity. 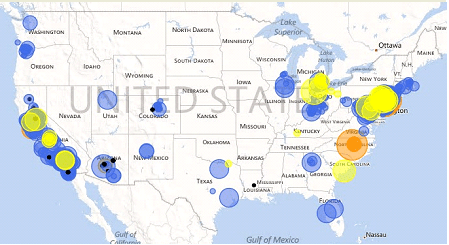 See the locations of the on-site PV systems identified by this research on our interactive map. The rapidly falling cost of solar energy has made solar an increasingly appealing investment for American businesses. Between the second quarter of 2011 and the second quarter of 2012, the average price of a completed commercial PV system fell by nearly 14 percent.3 The economics of PV have become so attractive that many of the best managed corporations, which are synonymous with low cost and efficiency, are adopting solar energy on a massive scale across the U.S. In addition to installed capacity, this report also ranks companies by the number of operating installations as well as the geographic diversity of their solar deployment. See photos from the report's top solar installers in our photo gallery. Energy can make up a significant portion of a business’s operating costs. Companies are installing solar at record rates because it reduces operation expenses, improves their bottom line, and allows them to focus resources on their core business strategies. The price of solar energy systems has dropped rapidly over the past 5 years. In some places, it is more cost-­‐effective to deploy solar than buy electricity from the local utility. And no matter where the company is located, solar provides predictably priced electricity for 20 to 30 years. This hedge against utility price volatility is highly valuable to businesses that are focused on managing long-­‐term budgets. Combined with innovative financing options that further reduce upfront costs, solar has a new value proposition that makes business sense for major companies nationwide. Companies across the country have made enormous investments in solar to manage their operating costs. 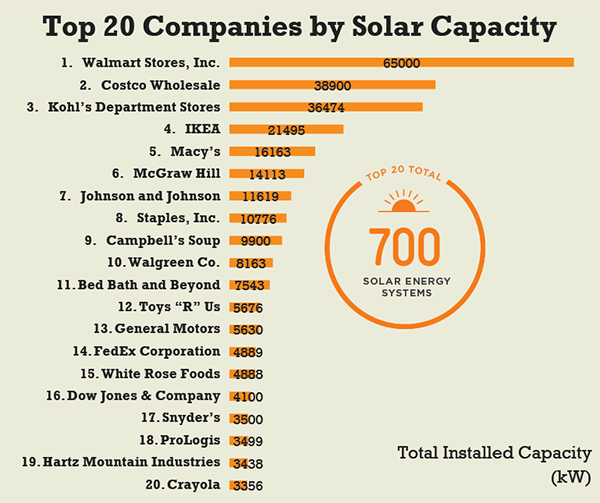 The list above ranks the top 20 of these companies by the installed capacity, or the maximum power potential measured in kilowatts (kW, 1,000 kW = 1 MW), of all of their on‐site solar installations. Some companies have high energy demand at a single facility and build one or two large systems to meet that need. 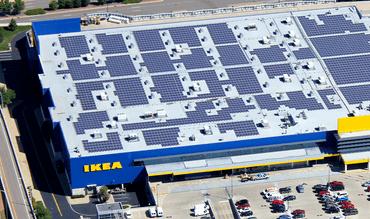 Others have dozens or hundreds of stores and facilities that could benefit from solar. 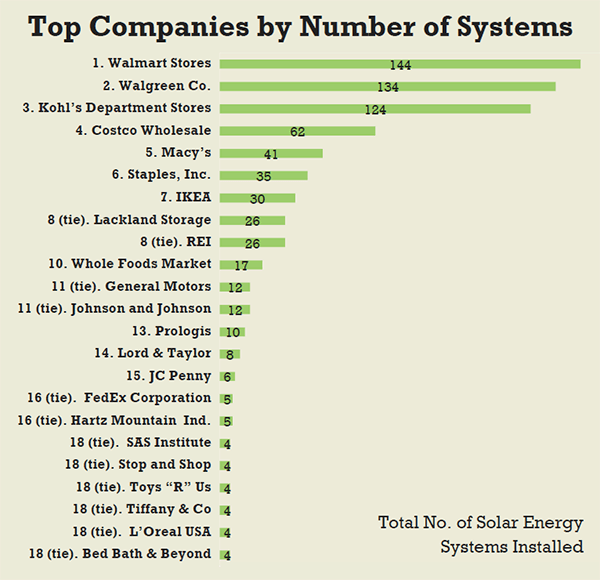 The rankings above list the Top 20 companies by the number of solar installations at company locations. Those at the top of this list have made repeated decisions to go solar, building off of earlier successes. 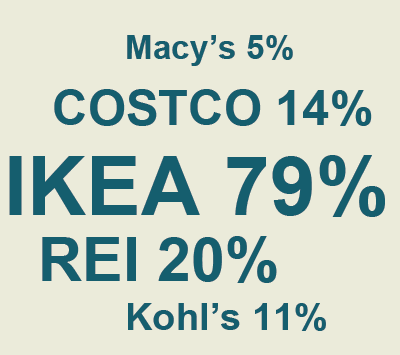 The data at left demonstrates the percentage of U.S. company stores with solar for a few notable companies. It is not a full ranking, rather a comparison between some of the top solar users that were already part of this report’s analysis. It should be noted that smaller companies could well have solar at all of their company locations or could even be net exporters to the grid, meaning companies generate more solar energy onsite than is consumed by their facility. While companies with facilities in California and the Southwest have certainly taken advantage of the ample solar resources and effective solar policies, corporations have gone beyond those well-­‐ known solar markets with installations all across the country. Many corporations have solar energy systems in diverse states including Michigan, Wisconsin and Massachusetts, which is a strong indication that solar energy can make business sense in all U.S. climates. 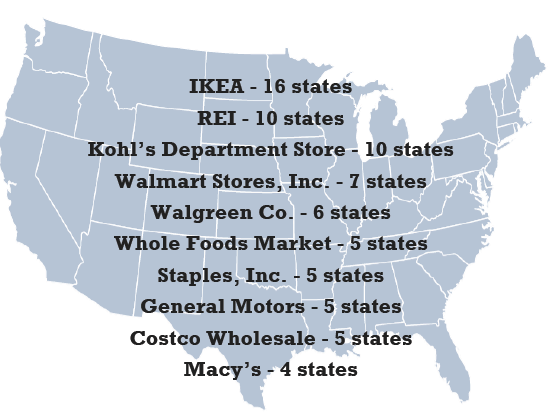 This list ranks the top companies by the number of states in which they have deployed PV at their facilities. The companies ranked here and many more continue to expand their investments in solar energy at a rapid pace. Companies such as Apple, which has a 20 MW system under construction at a datacenter in North Carolina, have announced plans for major solar deployment. Others such as General Motors have decided to enter the solar business themselves. Businesses as well as other large energy consumers like non‐profits, schools and public agencies are expected to add 7,000 megawatts of additional PV systems over the next five years. That’s enough to replace seven retiring coal power plants. The Solar Energy Industries Association (SEIA) and the Vote Solar Initiative (Vote Solar) set out to rank the top corporate users of solar energy in the U.S. To do this, SEIA and Vote Solar combed public databases and contacted company representatives to collect data on their use of PV systems.4 While researchers made every effort to collect detailed, complete and accurate data, not every company responded to surveys, and public databases do not capture all installations. Furthermore, new systems are installed every day. In the first half of 2012 alone, over 3,600 individual non-­‐residential systems came online in the U.S. Ultimately, SEIA and Vote Solar believe this is an accurate portrayal of the leading corporate users of solar energy in the U.S., but reserve the right to make adjustments as new data becomes available. SEIA and Vote Solar only counted on-­‐site PV systems that supplied power directly to company facilities. This does not include utility PV power plants that sell wholesale electricity. While some companies buy solar renewable energy credits (SRECs) from solar power generated off-­‐site, this report does not consider such transactions due to limitations in data collection and verification. Likewise, SRECs produced by many onsite PV systems are sold to utilities or other buyers; while companies that sell their SRECs do not retain the environmental attributes of the system, such systems are still counted for the purposes of this report as the decision to deploy an onsite solar system is an essential step in solar energy development. Many important companies have made massive investments in helping others go solar. Bank of America, Merrill Lynch, Google and others have provided billions of dollars in financing for solar energy systems in the U.S. While these investments are big business and central to the development of the solar energy industry, they are not the focus of this report. These rankings only include PV systems that were operational as of mid-­‐August 2012. If you see an error or omission or would simply like to add new data, please email research@seia.org. 1 A megawatt of solar capacity is enough to supply all the electricity needs for 75-­‐218 homes depending on the region of the country. For more info see What's in a Megawatt? 4 This report only considers the use of photovoltaic systems, which produce electricity. It does not represent the use of solar heating and cooling (SHC: water heating, space heating, space cooling or process heat) due to lack of public databases.